As you go about developing software for your company or clients, it’s a no-brainer to implement a system of bug and issue tracking. Otherwise, how would you get anything done? Anyone who has developed the smallest piece of software knows that bugs show up throughout the process. If you’re just starting out, you might be using spreadsheets or (gasp!) post-it notes to keep track of the bugs you need to fix. But if your project is more than a one-person-show, you’ll need a more robust system of bug tracking in order to coordinate team efforts. This simple 3-step list contains our essential recommendations for a smooth bug and issue tracking process. There is a famous saying: “What gets measured gets managed.” That’s why it’s important to log all bugs in an issue management system. If the details of a bug don’t make it into a bug tracking system, then a portion of them will not be fixed in a timely manner. Bug and issue tracking only work when bugs are assigned to be fixed by a teammate. You can have a mile-long backlog of bugs that will never be fixed until they are assigned to someone to do the work. So make sure that you assign every bug to a fixer, with priority and due dates attached. A good bug tracker tool will have these features included. Software development requires accountability. No one’s going perfectly – the best coders in the world still need a 3rd party to test the application and make sure it is working. Testing is one of the key core principles of best coding practices. You can bypass many other smaller steps in the bug management process, but you should never skip the testing phase. Doing so could mean significant errors, angry customers, and lost revenue. Make sure that whatever bug and issue tracking tool you use has a provision for testers to verify that an issue is fixed. This article is an example of a good issue workflow. This is an often overlooked part of the bug fixing process. Sometimes you can work on multiple bugs and issues in the same day or week. In many circumstances, it can be counterproductive to push small fixes to production individually. You may want to set a batch of bug fixes live at the same time. From a bug and issue management perspective, you should also use the same workflow. For example, if you fix six bugs in a day that are all related to a larger problem, you may want to send all of those resolved issues to a tester at the same time. This prevents testers from being bombarded with individual testing requests. It’s better to send a batch of fixes for testing at the same time so that the tester understands their context. 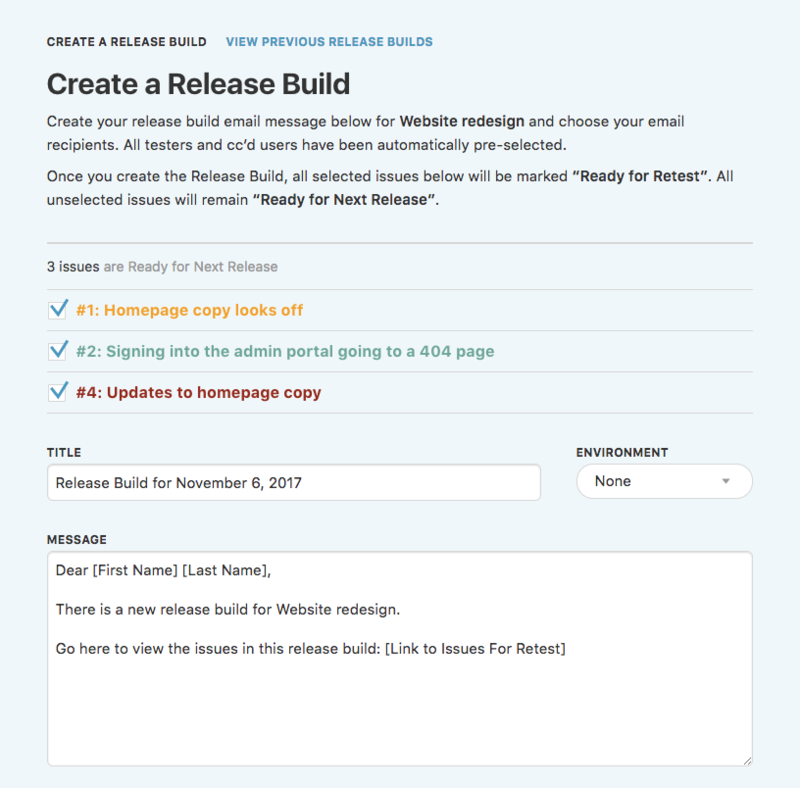 DoneDone’s release builds feature helps teams manage this process easily. It’s also a great way to reduce miscommunications and keep the team on the same page. 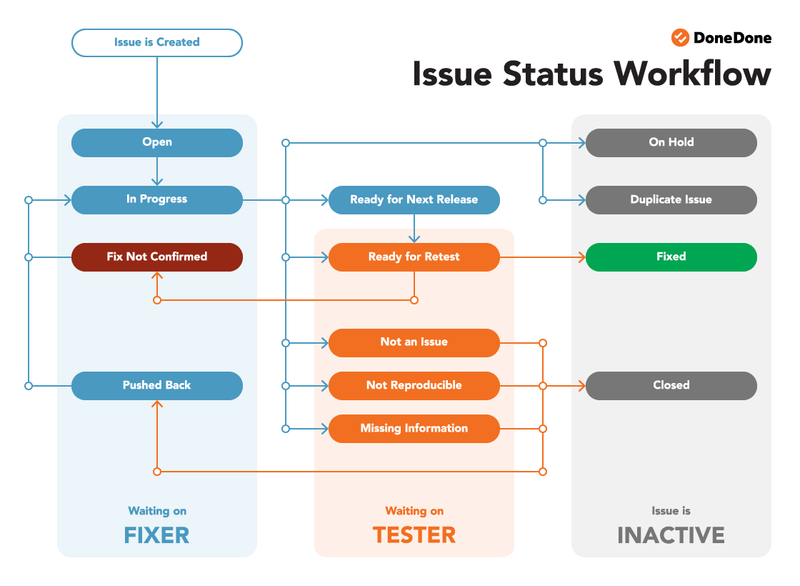 If you follow these three steps when designing your bug and issue tracking workflow, you’ll cover most of your issue management needs. Always log your bugs as soon as you find them. Always have a 3rd person designated as a tester. Always push your fixes live when they’re ready to go, and preferably in the way that is least time-consuming. If you’re looking for a simple bug tracker, check out DoneDone. It’s a lightweight productivity app designed by developers for developers. You’ll find a slew of handy features that make bug and issue tracking a breeze. Click here to explore DoneDone’s features.